It’s time for sun, surf and taking time out at two of East London’s top hotels. 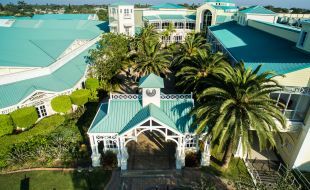 Feel yourself start to relax as soon as you walk through the doors of Southern Sun Hemingways. This elegant hotel with a distinctive ‘island-life’ ambience is a great base for your visit to the laid back city of East London. Each room is equipped with air-conditioning for those hot summer days, and a range of modern facilities and services to cater to your comfort, including a fitness centre, free WiFi, conference facilities for professionals and much more. 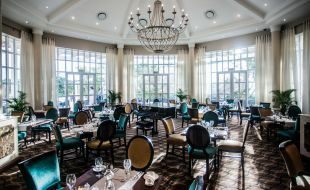 Located even closer to the beautiful Indian Ocean is the Garden Court East London. Ideally situated on the East Beach Promenade, you will enjoy the sweeping beach views from your spacious room. Each room has a writing desk, WiFi, DStv and air-conditioning along with other convenient amenities. The hotel also has a self-service workstation, a restaurant and coffee shop. 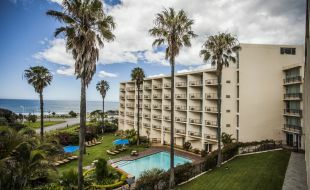 Enjoy all of the comforts of home just metres away from the beach. On South Africa’s Sunshine Coast, sparkling waves break onto unspoilt beaches lined with lush, green vegetation. Long before the British discovered this beautiful part of the Eastern Cape, the Xhosa inhabitants lead peaceful and simple lives. Today, you will find that the Xhosa culture has survived and it is still being preserved. The Khaya La Bantu village will allow you to experience this special cultural heritage firsthand. The subtropical sun shines down on a culturally diverse selection of friendly locals who will be sure to welcome you to this modern city. Whether you plan to simply relax and top up your tan or try your hand at surfing some of the epic waves, East London’s beaches are some of the finest in the world. 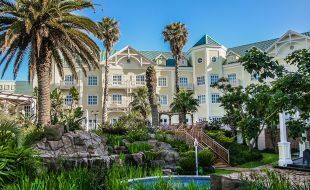 From Garden Court East London take a short stroll along the sand to Orient Beach, which has a sheltered swimming area, tidal pool and fun for the whole family with water slides and kid’s splash pool. This game reserve near East London is home to the Big Five. It also has an Elephant Sanctuary where you can interact with these beautiful giants and even go on an elephant-back safari, which will surely be a highlight of your visit. Only five minutes from the busy city of East London is its own game reserve. Get close to lions, Bengal tigers and play with the adorable tiger and lion cubs! Just 21 kilometres away from East London, you'll find this stunning little seaside town. It lies on the Gonubie River, which is popular for canoeing and kayaking. Explore the Gonubie Lagoon, enjoy a swim in the tidal pool, or take a stroll along the spectacular boardwalk ideal for whale and dolphin watching. Take a 30 minute drive from East London to this interesting inland town. It was founded in 1835 during the Xhosa war and it has one of the oldest post offices in South Africa. Visit the Amathole Museum to see the most famous hippopotamus in South African history, Huberta, who travelled all the way from Northern Zululand to East London in the early 20th century.